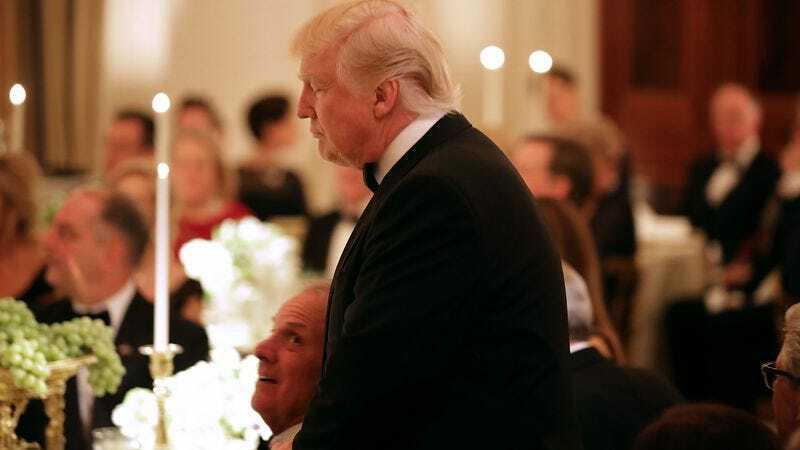 In an “exclusive” interview with what will soon be the only media outlet left inside the White House Press And Frozen Steak Storage Room, Donald Trump tells Breitbart that the Oscars’ Best Picture mix-up was due to their being so distracted with political talk. While this is probably indirectly true—in the same, soul-enervating sense that makes everyone’s days feel like a meaningless slog spent idly awaiting Armageddon—Trump, of course, means it with far less nuance. “I think they were focused so hard on politics that they didn’t get the act together at the end,” Trump said of the moment when PricewaterhouseCoopers partner Brian Cullin mistakenly handed presenter Warren Beatty the envelope for Best Actress instead of Best Picture, a mistake that some have attributed to this year’s slightly more illegible design, while some others have accused Cullin of being too distracted with tweeting backstage celebrity photos to do his very simple job. Nevertheless, one thing is perfectly clear to him: All energy flows according to the vibrations of Donald Trump, the chaos butterfly who can flap his Twitter wings and suddenly the markets are in flux, the very definition of “facts” is in question, and Emma Stone is briefly embarrassed. We are all of us at his mercy. We may never truly know which movies are good again.